After a hard day of work, I would be very hungry and I always wanted my evening snack to be a combination of sweet, spice and crunchy. So many days when I get bored of eating fruits I ended up eating lots of junk food. I felt guilty of consuming fatty foods and somehow I want to avoid this. After trying out a few different combinations, I found one super duper filling snack which is healthy and tasty. 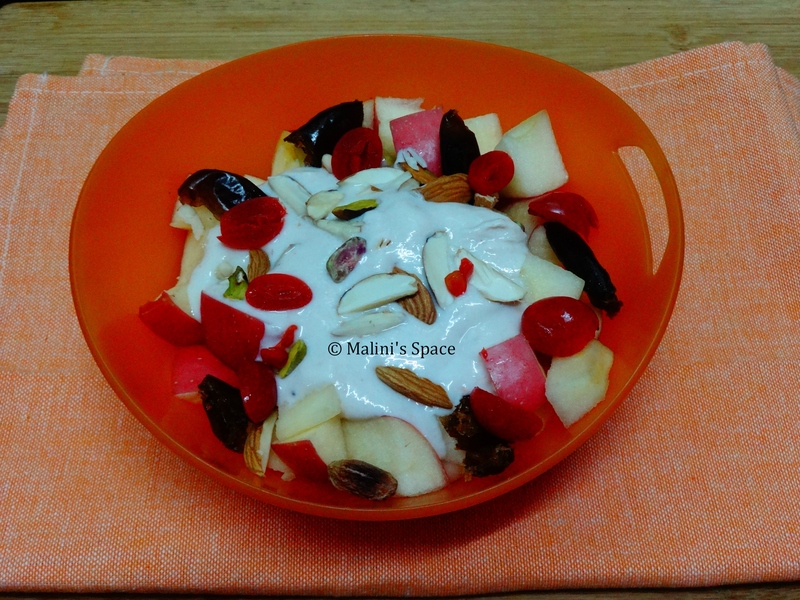 I took fruits (apple, pomegranate), nuts (almonds, pistachios), Dates, plums and mixed everything in a bowl and added Greek yogurt on top of that. Malini that’s a good idea and yes I eat my cornflakes with all the fruits and nuts together. It is filling and gives the sweet taste you desire for.